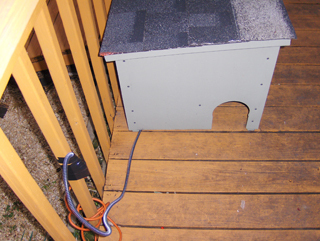 Some FeralVilla owners have explored various options for heating the FeralVilla to provide some additional protection in very cold climates. Although the shelters are designed to protect cats for the average midwestern (Indiana) winter, some climates are obviously much colder for much longer, and it may be beneficial to provide heat inside the shelter. Have the electrical device connected to a plug that is protected by a GFI (Ground Fault Interrupter, also called Ground Fault Circuit Interrupter). This adds one more measure of shock protection. Use only devices designed for outdoor use, and for use with pets. Do not use bare light bulbs or medical heating pads, as they are not designed to withstand the environment or possible damage by claws, chewing, etc. Outdoor pet heating mats or pads are sealed, usually in a plastic casing and the cord is wrapped with a steel wire armor for at least part of the length. "The pad size is 12.5 x 18.5. The instructions say NOT to use an extension cord, but I really had no choice due to the location. I am quite sure a heavy duty outdoor cord is fine. I tested the pad indoors and it does not get hot to the touch. It stays about 15 degrees warmer than the surrounding temperature at all times. It heats to a max of 102 degrees, but only when the animal is actually lying on it utilizing the animals body to trap the heat. It does provide a fair amount of radiant heat. It should not be covered with anything other than the fleece cover provided and you should have an area set aside for the animal to be able to get off of the mat. The villa is large enough to provide that over to the side. In cold weather I don't think they will want to be off the mat very much anyway, but to be safe it should always be an option." Brian included these pictures too! "Although we put straw in the villa, my husband and I were concerned about the severe cold this winter, so we searched for a safe way to add heat to the villa. We found a heated pet mat made by Allied Precision (model 98P-S) that measures 13"x19" and is 60 watts with a fairly long cord enclosed in a protective metal spiral. The mat is meant for outdoor use and is hard, enclosed plastic; it comes with a fleece mat, but we did not use it. We purchased it from Tractor Supply for about $40 or so. The size is perfect for mounting inside the top level of the villa on top of the inner supports, pushed to the far side of the entry hole. It isn't thick, so it doesn't take up too much room. We were concerned it would shift, so we mounted a couple of metal 'guides' to hold it in place. We made a small notch in the top of the villa, pushed the cord into it and then wedged a piece of foam insulation on top of the cord. There is just enough room between the inside edge of the roof and the top of the villa for the cord to hang down the outside. Emma now has 'ceiling heat', and she loves it!" What about the Snugglesafe microwaveable heat disc? At roughly $30 (from Amazon, as of 3/2012), the Snugglesafe offers an option when no power is available. The disc, about the size of a small Frisbee is heated in the microwave for a few minutes, then radiates heat for hours. It's strongly suggested that you use the cover, as the disc can be very hot when it first comes out of the microwave. Cons: You will need to open the shelter to remove, re-heat and insert the disc. 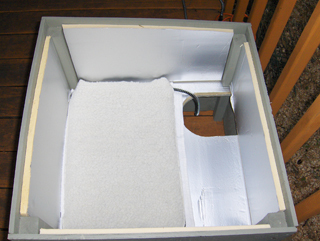 If a very skittish or feral cat is living in the shelter, opening the top while the cat is inside is likely to scare them and may scare them away from using the shelter. Be very mindful of this, or your good intentions of providing a heated shelter may leave a scared cat out in the cold!